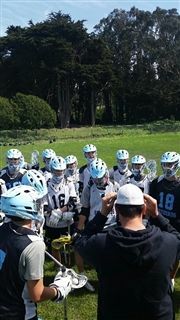 During Spring Break, the Boys Varsity Lacrosse team traveled north for a week of team bonding and fierce competition in San Francisco. The Firebirds came away with two impressive wins against top-ranked California teams - San Francisco University High School (16-9) and Bellarmine College Prep High School (7-5). According to Coach Collins, the Bellarmine game was one of the most memorable in program history. A stout defense held the score to 5-5 at the end of the third quarter, while in the fourth quarter a combination of spectacular offense and phenomenal saves by goalie Reed Levesque clinched the win. Coach VanSant attributed the victory to the team's resilience and unity. Following a six-game winning streak, the Firebirds have shown that they are elite competitors. Pacific Ridge is currently ranked first in San Diego, third in the state, and sixth out of the nearly 600 high school programs on the west coast.